The story began with James Bland when he wrote "Carry Me Back to Old Virginny" in 1878. 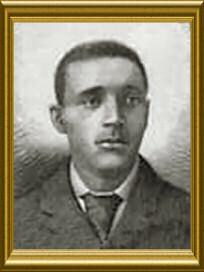 James "Jimmy" Allen Bland was born on October 22, 1854 in Flushing, Long Island, New York. When he was 12 and living in Philadelphia, Pennsylvania, he saw an old black man playing a banjo and singing spirituals. He fell in love with the banjo and tried to make one using bailing wire for strings. This didn't work very well and, besides, a big kid took it and broke it into pieces. Jimmy's father bought him a real banjo for $8.00 and Jimmy taught himself to play... very well. Later, the family moved to Washington, D.C., where Jimmy finished high school and enrolled in Howard University. He was so talented and had become so proficient with the banjo that he was entertaining professionally at private parties and in hotels and restaurants from the time he was 14. At Howard University, he met a young lady named Mannie Friend. On a trip with Mannie to her birthplace in Tidewater, Virginia, Alan Bland composed "Carry Me Back to Old Virginny". Sitting on the banks of the James River, Mannie wrote the words down on paper while Jimmy played and sang to her. Though "Carry Me Back to Old Virginny" was the only song he wrote that became an official state song, he wrote many more memorable melodies in his lifetime; songs including "Oh, Dem Golden Slippers", "In the Evening by the Moonlight" and 700 others. For additional information about James Allen Bland visit the Songwriters Hall of Fame and the African-American Registry. 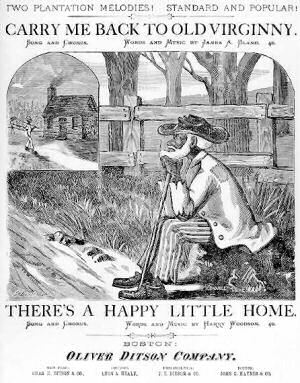 The song, "Carry Me Back to Old Virginny", words and music by James Allen Bland, was adopted as the official state song of Virginia by the General Assembly with House Joint Resolution No. 10 in 1940. Even as it was adopted, some expressed concern over the lyrics. In fact, the name of the song was changed from "Carry Me Back to Old Virginny" to "Carry Me Back to Old Virginia", either at the time of adoption or perhaps in 1950 or 1966. In 1970, Virginia Senator Douglas L. Wilder objected strongly to the song's lyrics with their romanticized view of slavery and worked to dethrone the song with little success. After being elected Governor of Virginia (1990-1994), he again initiated legislative efforts to retire the song. In 1994, Senate Bill No. 231 was introduced, proposing to modify the words to the original song. Senate Bill No. 231 addressed words within the lyric considered to be offensive to some, but leaving most of the verses intact. Specifically, five words were addressed and changes suggested. Dreamer's was offered as a replacement for darkey's. My loved ones was offered as a replacement for old Massa. Mamma was offered as a replacement for Massa. Papa was suggested to replace Missis. There's where this old darkey's dreamer's heart am long'd to go. Than old Virginia, the State where I was born. A later Senate amendment proposed to change the word am to has in the two places. Also in 1994, House Joint Resolution, No. 179 was introduced, in the Virginia House of Delegates, requesting the Secretary of Health and Human Services to "...to review the official state song and make recommendations for changes to its language, as certain lyrics are offensive to many citizens of the Commonwealth." Both of these 1994 measures failed to win approval. In 1996, both the Senate and the House introduced legislation replacing "Carry Me Back to Old Virginia" as the state song with "Old Dominion," by Adele Abrahamse. These measures made no progress, however, after being referred to committee. 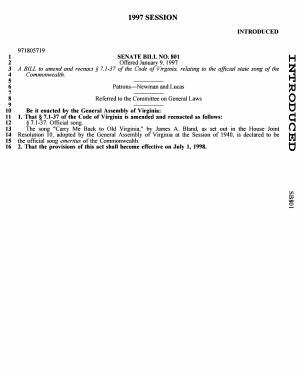 In 1997, more legislation related to the Virginia state song was introduced, among them Senate Bill No. 801 sponsored by Senator Stephen D. Newman of Lynchburg. On January 9, 1997 Senate Bill No. 801 was introduced proposing that "Carry Me Back to Old Virginia" be declared the "state song emeritus." This bill had the effect of maintaining the song as an historical document while retiring "Carry Me Back to Old Virginia" as the official state song. § 7.1-37. Official song emeritus and official song. The Virginia House of Delegates passed House Bill No. 801 with one minor amendment, eliminating the effective date, on February 17, 1997. The legislation designating Carry Me Back to Old Virginia as the state song emeritus was signed by Governor George Allen on March 20, 1997. The following information is excerpted from the Code of Virginia , Title 7.1, Chapter 5, Section 7.1.37. The words and the sheet music are included within the statute. § 7.1-37. Official song emeritus. The song "Carry Me Back to Old Virginia," by James A. Bland, as set out in the House Joint Resolution 10, adopted by the General Assembly of Virginia at the Session of 1940, is declared to be the official song emeritus of the Commonwealth.